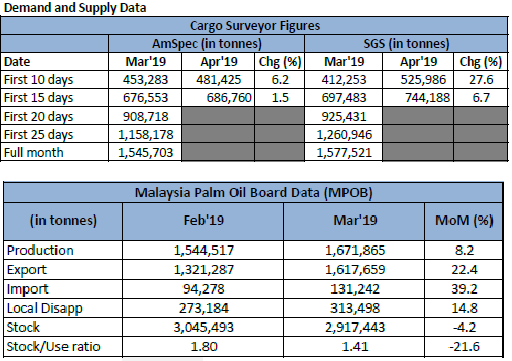 Malaysian palm oil futures rose during the first half of trade on last Friday, tracking strength in U.S. soyoil on the CBOT and optimism that the pace of export demand will pick up. Palm prices also posted for a weekly gain, up 1.6 percent so far, supported by declines in the ringgit. Gold prices last week has headed to its lowest level since end of December last year, as concerns on the global economic growth has eased over better-than-expecetd China data. Oil futures climbed Thursday, with the U.S. benchmark posting its seventh weekly rise in a row—the longest streak of weekly gains in about five years. Prices were trading in a weekly range between $62.99 and $64.61 per barrel. During the week just ended, Bursa Malaysia was traded mostly lower due to the absence of firm direction, while market sentiment was further weakened by Malaysia’s possible removal from the World Government Bond Index. CBOT May Soybean futures dropped more than 1 percent in the week ending 19 April, to its lowest price since November last year.